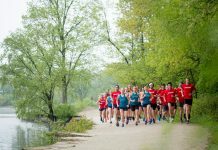 Polish Independence 10K Run/Walk (Bieg Stulecia) is a race commemorating the 100th anniversary of Poland’s resurgence as a sovereign country on Nov. 11, 1918. 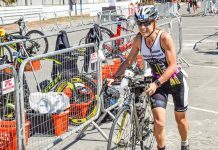 This Chicago race is a part of bigger endeavor that includes 100 races held around Poland and abroad on the same date (including New York and London). The race director had as many participants as they planned, a symbolic number of 1918 – the year Poland regained independence after WWI. They filled all of the spots before the day of the event and they had to say no to people who wanted to sign up the day of run. It was a sunny but cold and crispy morning in Chicago. Packet pick up was available on race day. 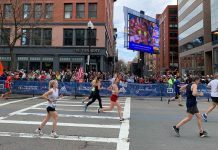 This race had an unusual late start of 11:11 a.m. but with the time changes and cold weather, it was quite nice to sleep in and run in the middle of the day. There was a special energy at his event, something I had not experienced in quite some time; the crowd proudly wore red and white and carried flags. At the race start, all the announcements were in polish and they sang the polish anthem followed by the American anthem. I was blown away by people’s enthusiasm when singing their anthem out loud. Lots of hugging and well wishes as we we got ready to start right at 11:11 am on the Montrose Harbor lakefront path. We went north on the path for about 1.5 miles where we turned around to run south and then north again. There were two water station for runners with water and awesome volunteers and people cheering. All finishers receive a custom Bieg Stulecia medal and they had prizes for winners of different age/gender divisions. The post-race celebration included polish sausages and beer! Plus live music by 103.1 FM DJ Radio. 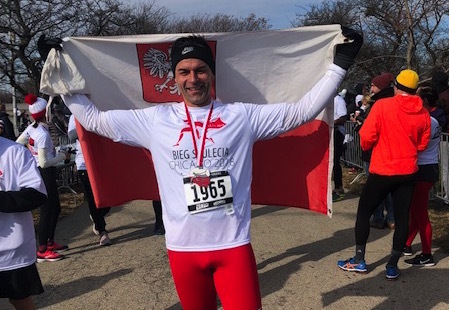 I later found out that Bieg Stulecia translates to “the course of the century.” It was a pleasure to participate in this event and be a part of the first Polish American run of this scale.